T's been asking to go to the zoo for days, but I didn't want to haul her all the way into town this weekend - though I do have dim-but-fond memories of the Paris Zoo from when I was a teeny tiny Continentalist in Paris a good quarter of a century ago. So I took advantage of a gorgeous Sunday and took T to the very cute Ferme du Piqueur in the Parc de Saint-Cloud instead. 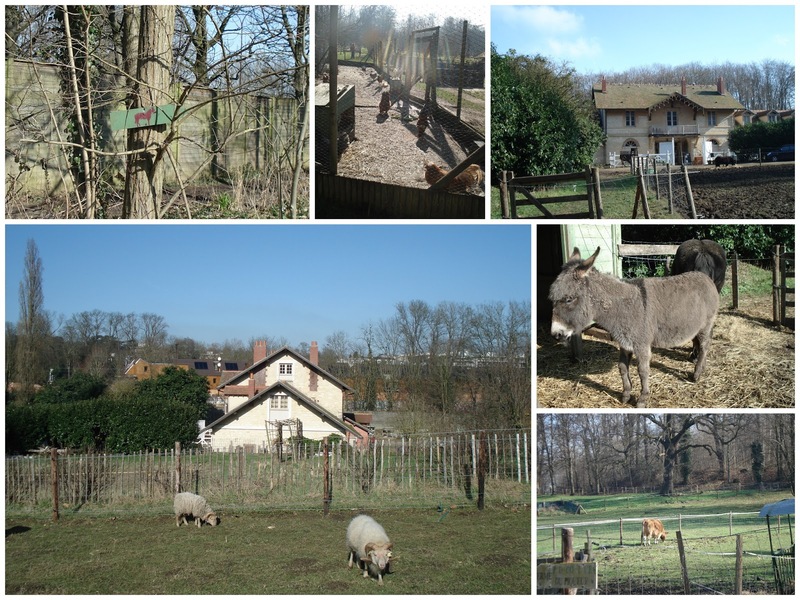 The two-hectare farm, which dates back to 1824, features sheep, goats, chickens, pigs, a red cow, beehives, and a separate enclosure with horses, ponies, and a donkey (who, of course, reminded T of Lost Donkey...). It's an educational enterprise with a focus on fostering awareness of nature and the need to take care of our environment; they also offer customized workshops for kids and disabled adults. Entry is €2.00 per person and under threes are free. We took the cheapskate's route and walked around the part where you have to pay - you can still get pretty close to the cow, sheep, equids, and chickens (though we had to settle with seeing the rabbits and goats from afar, and since I'm a shrimp I couldn't see the pigs at all over the wall of their enclosure). There are also some great trees for climbing nearby. T and I went with my grandfather and sister 4; the walk took us a long time (and I was severely underdressed since I thought it would be a lot warmer given that the sun was shining), but it was good to hear my grandfather's full story of how he met my late grandmother. (He was a young policeman who almost died of appendicitis and she was an even younger nurse working at the hospital where he languished; he liked her but she wouldn't dream of dating a patient [or even a former patient] and after he was dismissed, he thought he'd never see her again - until he ran into her a few months later when she was on the way to the hospital for her own appendectomy. He asked if he could come by to visit her during recuperation, and the next summer they were married.) T likes the story a lot, but had only heard my bowdlerized version thus far. Education - what is it good for?